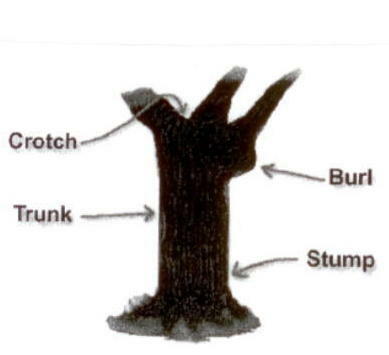 Crotch – where the trunk branches off into limbs. The grain pattern in crotches starts swirly, evolving into a full flame figure. Stump – at the base of the tree, the grain is swirly and twisted,producing small veneer pieces. Burl – from the wart-like gowths on the trunk of the tree. The grain pattern resembles a series of eyes laid side by side. Veneer leaves are typically small and often have defects. Burls are difficult to work with, but produce beautiful patterns. A log must meet certain grade requirements to be suitable for veneer. Depending on the method in which a log is cut, different wood grain and characteristics can be revealed. The log is centered on a lathe and turned against a razor sharp blade, like unwinding a roll of paper. The cut follows the logs annual growth rings producing a multi-patterned grain. Rotary cut veneer is very wide, often enough to provide full sheet (1 piece) faces. It is the most economical method of cutting veneer, but the leaves are difficult to match, and rotary veneer is best used for utility or paint grade surfaces. 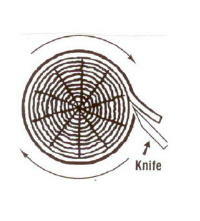 A variation of Rotary cutting, it produces flat cut (plain sliced) veneer. The cut is slightly across the annual growth rings, which shows the characteristics of plain sliced veneer. Since the veneer leaves can be kept in sequence, matching is possible. The slicing is done parallel to a line through the center of the log, producing a distinct cathedral grain pattern. The veneer leaves are sequenced allowing for consistent and balanced matching. The veneer log is mounted so the growth rings are sliced at approximately right angles, producing stripes or straight grained look. Quartered sliced oak logs often produce “flaking”. Wide logs are required for this method of slicing. Used for species of oak, rift is cut slightly off the quartered position, which minimize the “flaking” found in quarterd cut oak. The resulting veneer can be sequenced and matched.